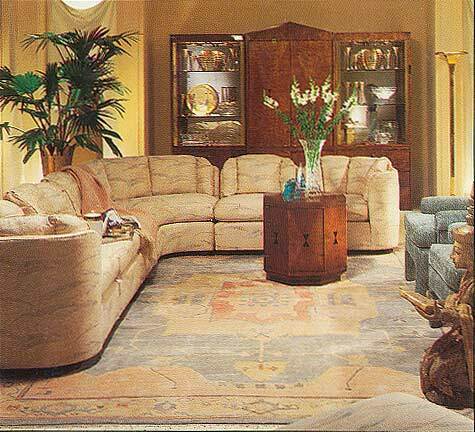 This Indo-Persian Nain easily coordinates with the fabrics and traditional furnishings used in this living room. The library and living room are visually connected by the traditional Persian designs and colors used in these oriental carpets made in India. Today's oriental rugs arc woven to suit an infinite realm of decorative styles spanning the traditional oriental looks to the European, Art Deco, and contemporary. Buyers can choose, for instance, Persian-style carpets featuring traditional hues or a wide array of timely decorative colorations. In addition to the tremendous variety of pile rugs, the buyer can also choose from an impressive selection of flat weaves, including dhurrie, kilim, chainstitch, and needlepoint rugs. Moreover, sizes run the full gamut in response to the variety of today's decorating needs. This contemporary interpretation of a Mahal carpet, handknotted in India, artfully blends in with this room's modern decor. 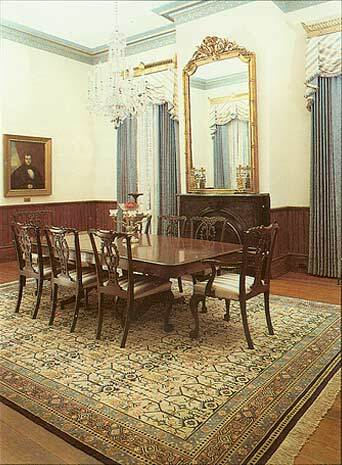 The traditional decor and furniture in this dining room are complemented by this oriental rug handknotted in China. 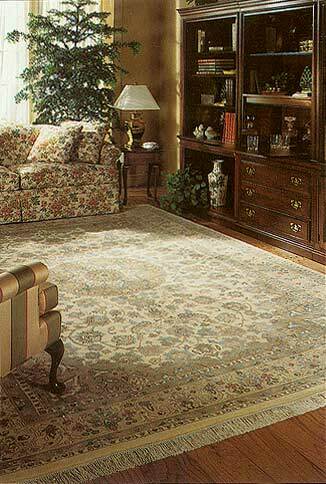 The most logical way to decorate a room is to start with the oriental rug. By extracting a single color from the carpet, one can influence the room setting's entire color and design scheme including that of upholstery, wall coverings, and window treatments. 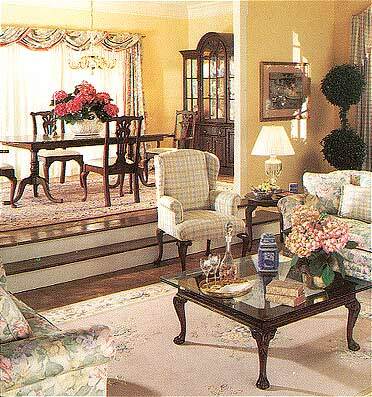 Similarly, a rug's pattern can inspire the particular furniture style to be used. 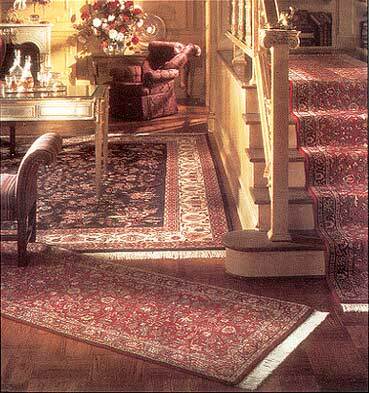 For example, a carpet exhibiting the French floral Aubusson pattern could be the first step in establishing a formal French mood and ambiance. Handwoven in China, these classic Persian and Chinese-design oriental rugs unite the living and dining areas of this home. 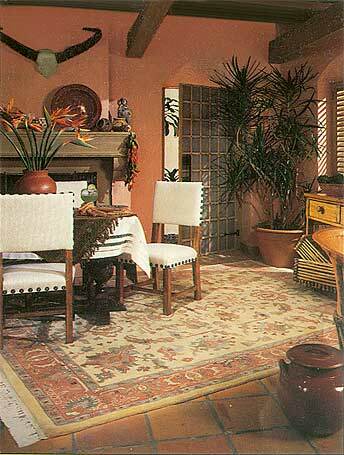 The floor covering used in this traditional dining room is a Chinese Kilim. However, incorporating the modem oriental rug into an existing decor is now virtually problem-free thanks to the infinite variety available. 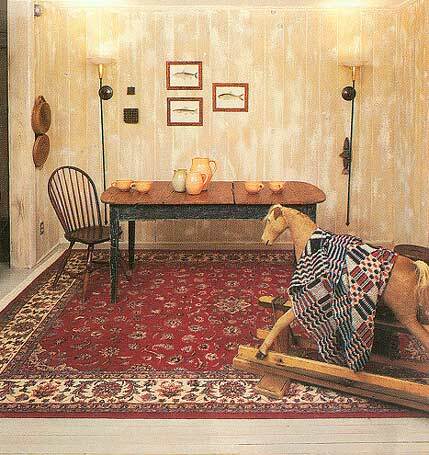 A particular decorative scheme can inspire the use of a specific rug type and style. For instance, an 18th century English decor could be the ideal setting for an English-patterned needlepoint rug as well as for a traditional Chinese Peking carpet. On the other hand, in a less formal decorating environment a dhurrie or kilim might be the perfect candidate. This living room makes an elegant statement about style. 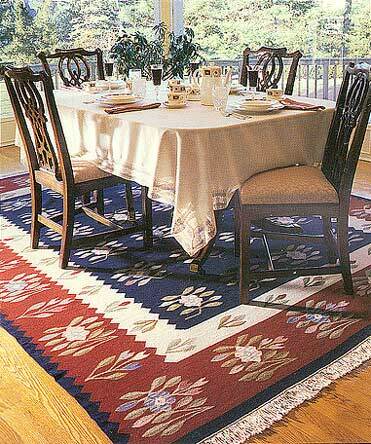 The oriental rug is a contemporary adaptation of a Serapi design handmade in Nepal. American arts & crafts decorates this panelled dining room, and the floor is covered with a Kashan-design oriental rug made in Pakistan. 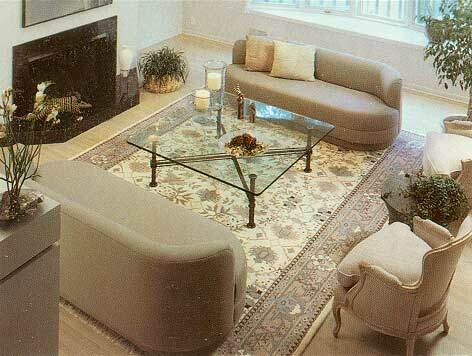 The examples presented here serve to illustrate how oriental rugs can be used in a variety of room settings. Indeed, with a little imagination one can transform an interior into one that is vibrant with personality thanks to the addition of a handwoven oriental carpet. Moreover, due to the tremendous variety in rug types and in the range of prices that have emerged in the last decade, this decorating option is now within virtually every buyer's reach. The floor is perhaps the most prominent decorative component � accounting for one third of a room's total space � and therefore deserves to be adorned with only the best. The spirit and warmth of the American Southwest are captured in the colors of this Persian design carpet handwoven in India.